You might be new to growing vegetables but don’t be hesitant. Growing cool weather plants will not only put good grub on your plate but give you confidence to install a larger summer garden. A vegetable garden will take more attention to growing conditions than hardier plants likes succulents and native plants. But with a bit of care like soil development and watering you will be rewarded with a rich harvest. For healthy, abundant gardens you will need a lot of direct sun, at least six hours per day. Don’t forget that the sun shifts on its axis during winter months and will light your yard differently, so be sure to ensure your cool weather plants are getting maximum sunlight. Check the light several times a day – morning, mid-day and afternoon before choosing your location. If in doubt, there are inexpensive devices you can buy to stick in your yard that will capture the number of hours getting direct sun. Ideally you should create raised beds for all of your vegetable gardening. This makes it easier to maintain and amend the soil for specific crops. Beds can be built with lumber from a big box store, railroad ties or bed kits which can be purchased from a nursery or online. Please know though that you can grow successfully right into the soil without building raised beds. The soil will need to be tilled or at least turned over at least six inches deep with a shovel. If you do a soil test the results will give you specific direction on the amendments you need to work into the soil. Without a test, at the minimum work in an organic compost product or purchase a quality manure for enrichment. If your space is limited you can have more diverse crops if you take the plants upwards. This will open up beds for other cool weather plants. Snap peas is a terrific example of a cool weather plant that would do quite well growing vertically. When it comes time for your summer garden, there are many more choices for vertical gardening. The mechanism for growing vertically doesn’t have to be complicated. You can put your bed next to a fence and use that structure for the vines. A trellis or plant cages can also be purchased from a garden supplier. As you plan your garden, consider the space you have available and how much growing space a plant will need. Some plants grow upright but many need a lot of room to spread out. Do your research which can be as simple as reading the back of seed packets or surfing gardening websites. Local nurseries and community colleges typically offer some terrific gardening classes. You can sow your garden in different ways – seeds from a packet or a friend, seedlings from a nursery. 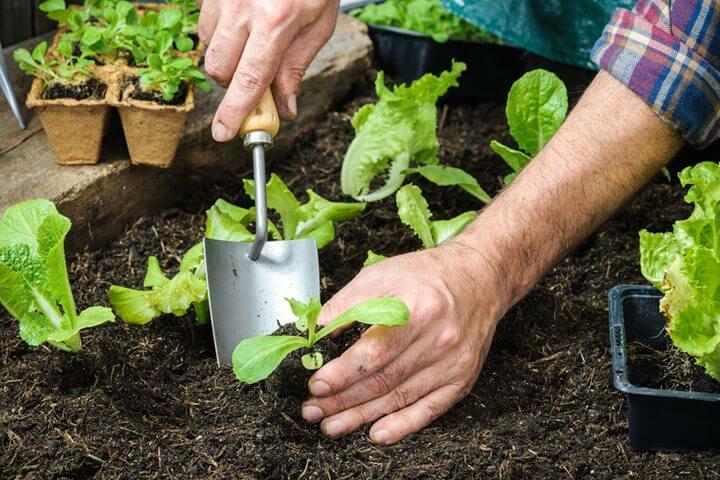 Many gardeners find growing from seed more satisfying but if you are a beginner gardener then seedlings might be easier for your first attempt. Seeds will need to be planted indoors in a green house, cold frame or under a grow light and will need about six weeks to be hardy enough to go in the ground. If you wish to plant seeds directly into your garden, check the seed packet for optimum growing and temperature considerations. Seedlings can be purchased from a greenhouse grower or a nursery and can be put into the ground once hard freezes are no longer a possibility. When resourcing either seeds or seedlings consider garden clubs as an option and sometimes you can even find gardeners sharing their plant wealth on forums like Craigslist. With cool February temperatures a plate of comforting greens and a veggie stew sounds really good right now. Think about the satisfaction you will have from eating your hand grown crops and that motivation should take you to a successful harvest of cool weather plants.